Slip into the river Lethe towards the other side. When we remember certain diners. Rises from their lips and tongues and throats. On the cooling board. Then letting go. The door. This happened when she was young. What is it now? A shell, dripped like lacquer on her skin? A splinter, stuck between vein and bone? Is still poison, even in a room filled with trust. He would burst into bloom. 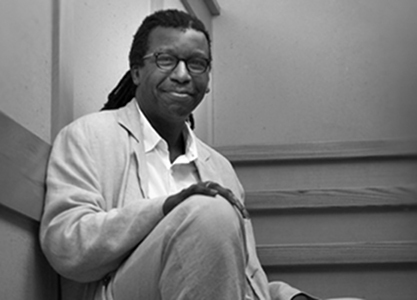 Cornelius Eady was born in 1954 in Rochester, New York. He is the author of seven books of poetry. the most recent being the critically acclaimed Hardheaded Weather (Penguin, 2008), which has been nominated for an NAACP Image Award. His other titles are: Kartunes, (Warthog Press, 1980); Victims of the Latest Dance Craze, (Ommation Press, 1986), winner of the 1985 Lamont Prize from the Academy of American Poets; The Gathering of My Name, (Carnegie Mellon University Press, 1991), nominated for the 1992 Pulitzer Prize in Poetry; You Don’t Miss Your Water, (Henry Holt and Co., 1995); The Autobiography of a Jukebox (Carnegie-Mellon University Press, 1997); and Brutal Imagination (Putnam, 2001). His work appears in many journals; magazines; and the anthologies Every Shut Eye Ain’t Asleep, In Search of Color Everywhere, and The Vintage Anthology of African American Poetry, (1750-2000) ed. Michael S. Harper. With poet Toi Derricote, Eady is co-founder of Cave Canem, a national organization for African American poetry and poets. He is the recipient of an NEA Fellowship in Literature (1985); a John Simon Guggenheim Fellowship in Poetry, (1993); a Lila Wallace-Readers Digest Traveling Scholarship to Tougaloo College in Mississippi (1992-1993); a Rockefeller Foundation Fellowship to Bellagio, Italy, (1993); and The Prairie Schooner Strousse Award (1994).